Information, comments and questions about the annexation of county property located east of Hwy 143 in Brian Head, Utah. Will water be coming to your subdivision? Property owners in the newly annexed subdivisions, Ski Haven Chalets Unit A, B & C, portions of Cedar Breaks Mountain Estates Unit B & C and Cedar Breaks Mountain Estates Unit A subdivisions are looking to extend water, sewer and road improvement services to their properties through what is known as a Special Improvement District (SID). They are looking to get culinary water and improved roads so they to can enjoy the benefits of their tax contribution to the town of Brian Head. Unless these improvements are done, they feel they are not benefiting from their annexation and increased taxes. Through an SID, the property owners within the subdivision will share equally the proposed cost of $1,500,000 for the improvements. With 125 lots involved in the SID each property owner will pay approximately $12,000 with interest payable over the next 10 years. Annual payments of approximately $1,200 would begin after the improvements are installed and complete. 51% vote by the lot owners is required for approval. I’ve heard property owners argue that this subdivision is underdeveloped and many property owners do not want to pay an extra $1,200 a year for a property they don’t intend to build on or develop. This subdivision currently only has a few cabins. Supporters justify the spending the money as property values will increase and owners will enjoy the improvements. In my opinion, this certainly will add value to the land in this area. This has been one of Brian Head’s most quiet and most rural areas. This approval will change the dynamics of this area. 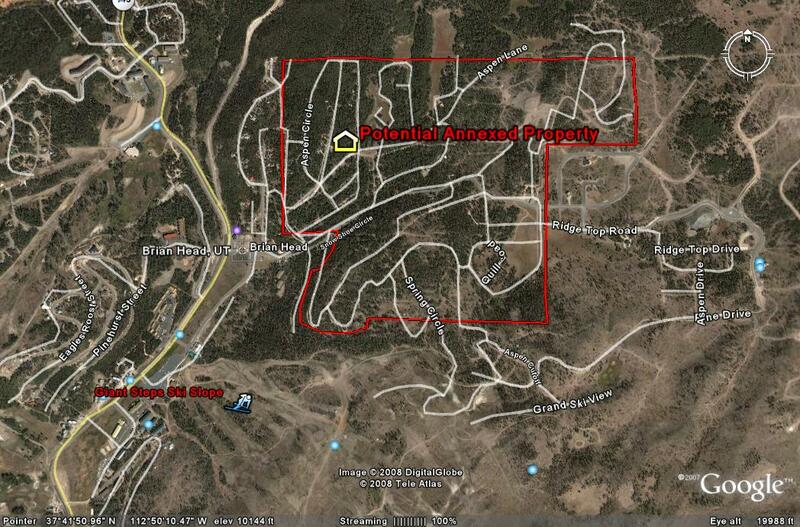 Lots are inexpensive and would provide a great area for a market that is somewhat unobtainable in Brian Head. We don’t have an area with improvements and priced low enough for lower end buyers. If current property owners are willing to sell their lots at current prices and pass along the SID expense the buyer, we will hopefully see a group of new people with great opportunities. Today the annexation PASSED 4 to 0. Members of the town council sat and listened to visitors and property owners express their support or opposition to the annexation. They felt that those who oppose the annexation feel that there is no confidence in the town committee in the continued growth of Brian Head. Will they receive a direct benefit? Yes. Will it be immediate? Perhaps. The town council feels that it is in benefit to the area to be annexted. There will be a benefit to keep more funds inside the town. Public safety time will respond quicker. Fire insurance is much less as a city property owner. The town will help the property owners develop. Brian Head town will now help to regulate the growth instead of the county and standards will be kept within the town guidlines. The town can help regulate and help property owners come and build. There is an officer on duty for immediate emergency for the surroundign areas. As Jim Ortler member of the town council, “We live in the mountains. This is a forest. Fire is the biggest concern for property owners. The town fire department and mitigation requirements will make this a safer area and community.” He made the motion to pass the annexation. The town Manager, Bryce Haderlie, sent me this information regarding the annexation of county properyt east of Hwy 143. Please read carefully and respond with your questions or comments. Any comments for or against the annexation posted here will be shared at the public hearing on the appointed dates. Due to the overwhelming request of property owners, the Town of Brian Head has initiated the annexation of an area which lies between Rue Jolley and Steam Engine Meadows subdivision. Those requesting the annexation understand the benefit of having access to utilities, garbage collection, police, fire, and road maintenance services by the Town. The proposed annexation includes the following Iron County subdivisions: Cedar Breaks Mountain Estates Units A, B, and C; Cedar Breaks Mountain Homesites Units A and C; Timbercrest; Sunset Mountain; and Ski Haven Chalet Units A, B and C.
• Grade and maintain the existing roads at least once in the spring and as needed during the summer. • Provide regular police patrol of the area which has been the responsibility of the County Sheriff’s Department. • Provide trash collection containers in the area that has not been serviced prior to the annexation. • Charge water and sewer rates for those connected to the system at the same rate as the incorporated area. • Provide opportunities for citizens to request improvements such as water and sewer line extensions as well as road improvements through Special Improvement Districts (SID). This would require over 50% of the people in an area signing a petition for the work. The benefits of an SID is that the Town organizes and manages the work, and the cost to each property owner can be paid over time with interest rates much lower than on the open market. • Allow neighborhoods to remain undeveloped if that is what a majority of the citizens chose to do. • Honor existing building permits, land use and setbacks obtained and constructed legally under the County jurisdiction. • Force people to connect to water or sewer services unless it is part of a public health issue and in conformance with the ordinances already established by the County. • Do snow removal on any street that has not been improved to a minimum gravel base course per the Brian Head Town Public Works Standards. • Use general fund tax revenue for building or improving roads. Road maintenance will be funded through the collection of B&C road funds and General Fund Property Taxes. Property taxes are collected to provide the government services such as police, fire, street maintenance, etc. In the event that the annexation is passed, Brian Head property taxes would not go into effect until 2009. The County is in the process of setting an additional tax for unincorporated areas to be similar to the incorporated community’s taxes. That rate is anticipated to be .001849 or $46.23 on a $25,000 property valuation. This amount would not be collected by the County if annexed into the Town. Instead, one would see a line item for Brian Head, whose current tax rate is .002713 or $67.83 on a $25,000 property valuation. The estimated difference: $21.60 a year. *One can multiple their actual assessed valuation by the two rates then take the difference to get a more accurate estimate for their particular situation. There will be a Public Hearing to address the annexation on July 22, 2008, at 1:00 p.m. at Brian Head Town Hall, 56 North Highway 143, Brian Head, Utah. We appreciate the support of everyone who realizes the advantage that can be had by being part of the Town and look forward to the opportunity to serve you. Brian Head Town Council has just approved the intent to annex 386.8 acres of county property into the town of Brian Head. This property is located to the north of Giant Steps ski slopes and west of Steam Engine Drive. This will effect many land owners who may or may not approve of this annexation. Can the town accommodate such a large addition to the town? Certainly many improvements are going to be made with utilities such as water, sewer, gas and electricity. Beyond the increase of taxes, what will be required of each property owner. Right now the area is growing very fast with individual property owners continually running more utilities through the area. Jim Ortler, member of the town council says that the growth is going to happen with or without the towns help. We might as well help it along and have a bit of control of the growth. Other council members also supports and recommends this annexation saying that it is a wise thing to do. Public hearing will now be scheduled where all property owners will be able to attend and voice their concern, approval and or support. I will continue to provide information as it is available.